Back to school means back to a routine and back to battling your picky eaters. Every parent goes through a point where they just can’t seem to satisfy the fussy food needs of their little ones. But providing a balanced lunch and healthy snacks is essential to your students’ success. 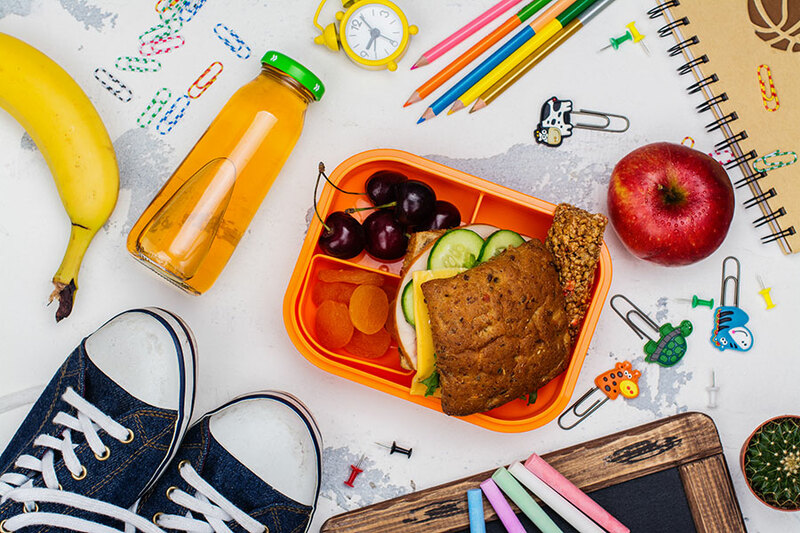 To help alleviate some of that back-to-school packed lunch stress and start the school year off right, we’ve rounded up five fun and healthy meals to keep your kiddos happy. PB & Js just not cutting it with the kids? Good! With high levels of sugar and fat, they’re not really bringing much nutritional value to the table anyway. This year, try Banana Dog Bites. The protein-packed bites are made from only three ingredients—whole wheat tortillas, your choice of peanut butter (almond or cashew butter would work, as well) and bananas. Want to up your packed lunch game even more? Serve em’ on a stick! Why? Because everything is more fun on a stick. For a fun twist on making sure your little ones get all of their daily greens in, try serving them an entirely green meal! Pack grapes, kiwi slices, celery, broccoli, edamame and a serving of pesto pasta. Switch up the colors each week—the same concept will work for yellow (corn, popcorn, bananas, cheese) and orange (carrots, apricots, shrimp, etc.). Even the pickiest of eaters love breakfast all day! By mixing up the meals, you’ll satisfy your opinionated eater and pack in all of the necessary nutrients to keep them happy and productive throughout the day. Fill your bento box with protein-packed pancakes, chicken sausage slices, blueberries and a tiny pot of sugar-free syrup. Having a hard time getting vegetables into their diet? Sneak in a serving with a pickle! You’ll be dubbed the coolest parent at school for serving up these pickle roll-ups! Plus, they take less than ten minutes to make, making them a total win! Pre-packed fast lunches are the expensive bane of every parent’s existence. Not only are they pricey, they don’t provide much in terms of nutritional value. So why not pack your own healthier version? Opt instead for whole-grain bread rounds, low sodium marinara sauce and part-skim mozzarella cheese. Kids won’t notice the difference in taste and you can buy ingredients in bulk, significantly lowering your week to week cost.